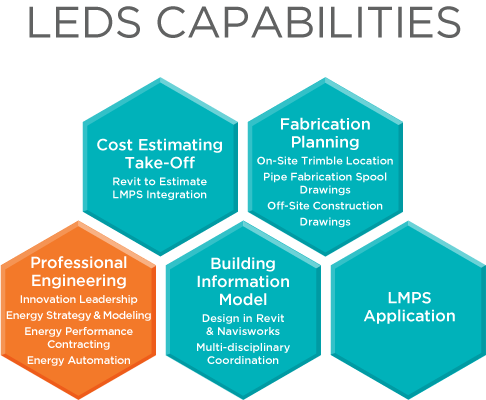 Founded in 1980, Limbach Engineering and Design Services (LEDS) is a division of Limbach created to provide in-house engineering for our construction units and their customers. Based in Orlando, LEDS works hand-in-hand with Limbach branches to serve customers. LEDS provides a suite of services to our branch operations and their customers ranging from project definition through commissioning, start-up, service and maintenance. One of the cornerstones of our value proposition is the application of LMPS to our customer's projects. Learn more about LMPS here.